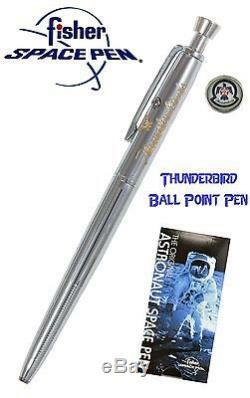 Aviation Series Thunderbird Pen and Pencil Set. 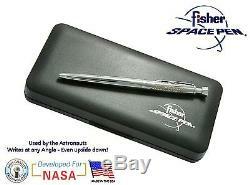 This is a New Fisher Space Pen, Model #T7PPS Aviation Series Thunderbird Pen and. 9mm Lead Mechanical Pencil Set. Yes, this is the United States Air Force Thunderbirds ink pen. It was Pilot designed with a "Gripping Knob" to allow easy removal and replacement from a small lower leg pocket of the pilots flight suit. 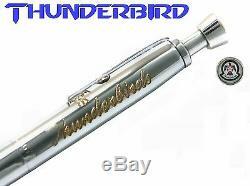 The photo below shows the gold inlay engraving of the Thunderbirds Emblem and name. This pen is also used by the Canadian Snowbirds Flight Team, the US Navy Seals and every Shuttle mission both US and Russian..... Not to mention firefighters, doctors, policeman. Fisher pens are used everywhere that someone depends on their pen. I ask this, why wouldnt you? It comes with black ink and a medium point. This is a retractable pen with a side button release that comes with a gift box and sleeve. 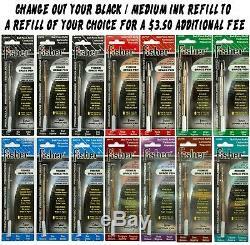 It uses the standard "SPR" series refills that are available in a variety of ink colors and points. 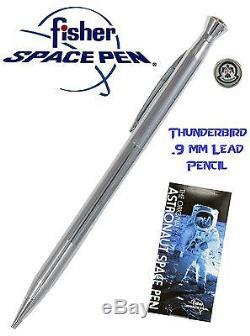 There is also the Thunderbird Pencil with the "Gripping Knob" also. This is a beautiful set that anyone would be proud to own. We see this as a Super personalized gift for any Military Pilot active or retired. The color of the lining in the box are usually grey but every now and then we get the red so this may vary. You can't go wrong with this one. Fisher Space Pens are guaranteed for life. Super nice pen, There is a Fisher on my desk, How about yours? He standard Fisher SPR Series Refills were developed for NASA and have been used on EVERY Space Shuttle mission both American and Russian. They are hermetically sealed with a. And pressurized to about 35 PSI. They are the only refills that will write at any angle because they do not rely on gravity. CHANGE OUT SERVICE TO YOUR ORDER. The Fisher refills fit the Retro 51 pens with the Parker adapters but the Retro 51 refills do not fit the Fisher pens so we have separate listing for the choices of the two pens. Type or paste the Listing number below into the search bar then add it to the shopping cart with the pen you are purchasing and pay at the same time. Fisher Space Pen Ink Change Out Service. Black / Fine, Black / Medium, Black / Bold. Blue / Fine, Blue / Medium, Blue / Bold. Red / Medium, Red / Fine. Green / Medium, Green / Fine. Fisher Space Pen is yet another great breakthrough from space research. No other pen has so much to offer. 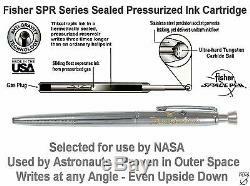 This pen was designed in 1965 by Paul C. Fisher, for NASA, and with no cost to NASA or our government. Ordinary pens rely on gravity to write. Hold them upside down and they quit. There was a need for a pen that would work in the zero gravity vacuum of space, and in extreme conditions. Paul Fisher developed such a pen. For the ink cartridge to write at any angle the cartridge was charged with 35 PSI of nitrogen. A small ball type float was used to separate the gas charge from the ink and it had to be hermetically sealed to hold the charge. With that type of pressure a precision fit stainless steel machined socket with a tungsten carbide ball and a specially formulated thixotropic ink was used keep the pen sealed and leak free. 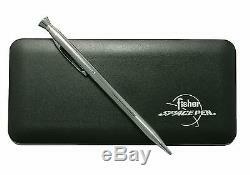 Fisher Space Pens have been used on EVERY Space Shuttle mission, both USA and Russian. They were also featured on a Seinfeld episode. Because it is hermetically sealed it will not dry out like other pens and has a shelf life of over a hundred years. It does not rely on Gravity, It writes upside down, in the vacuum of space, on wet paper, underwater, in the freezing cold of -30° F, and the boiling heat of 250° F. Fisher Ink cartridges stay leak free and writing longer, cleaner, and more consistently than any other ink cartridges. Fishers are not only utilized by Astronauts but the Thunderbirds, the Blue Angels, the Navy Seals, and the Canadian Snowbirds also use the Fisher pen. Fishers are favorites among Firefighters, Paramedics, and Police Officers. If you count on a pen to work, you need a pen with a Fisher ink cartridge. The Fisher Bullet Pen was exhibited at the New York Museum of Modern Art. It has been featured on the Tonight Show, Good morning America, John Ratzenberger's Made in America, and an episode of Seinfeld. Still proudly made here in the USA and I can tell you first hand Fisher Space Pen Company is made up of great people. 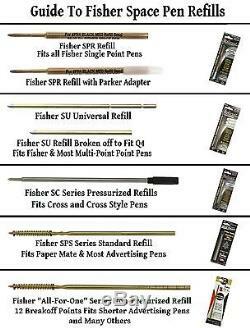 Fisher has a wide variety of pens to fit almost anyones wants and needs in a variety of price ranges. Of course, there are many series in between so you are sure to find the pen that fits your needs and style. Fisher refills come with an adapter to fit them to Parker and Parker Style ballpoint pens. Fisher also makes pressurized refills to fit Cross style pens. Just clicking on the store link, then select the category you would like to see from the list on the right hand side of the page. 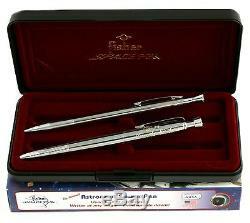 The item "Fisher Space Pen #T7PPS / Aviation Series Thunderbird Pen and Pencil Set" is in sale since Wednesday, March 27, 2013. This item is in the category "Collectibles\Pens & Writing Instruments\Pens\Ballpoint Pens\Fisher". The seller is "cyber_space_pens" and is located in Lake Placid, Florida. This item can be shipped worldwide.